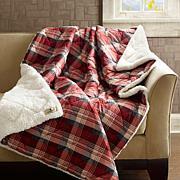 Your blanket should not only be plush, it should promote a sense of calmness and relaxation to help you fall asleep. 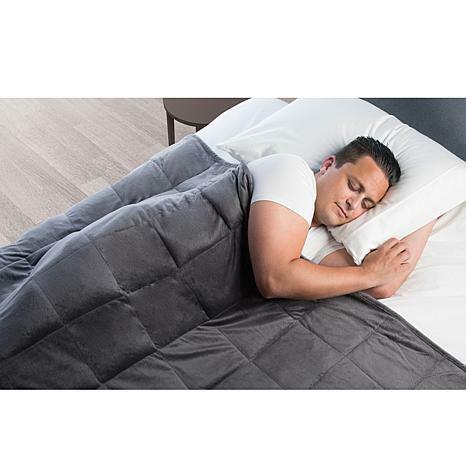 This weighted blanket works by applying an even amount of pressure. Sweet dreams. Do not use this blanket above shoulders and never cover head. User must be able to remove blanket on their own with no assistance. Keep out of reach and not for use on infants, toddlers, children or pets. Care: Spot clean with warm water and mild detergent. Lay flat to dry. Never place in dryer or hang to dry. My daughter loves this blanket. Recently divorced. I suffered from anxiety at night so I ordered this blanket to calm my spirit and nerves. This blanket did just that. I am getting the best night sleep. Worth the investment. This blanket is comfy and I feel secured. I like sleeping with weight over my body and this is better than having a full bed size blanket. 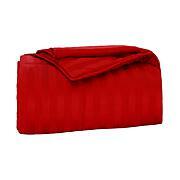 The size is perfect that it does not take a lot of bed space. Both me and my husband each have our own blanket. I love my calming blanket! It took a couple of nights for me to get acclimated to the weight and now I will not sleep without it. I am 130 lbs. and I choose the 10 lb blanket. My teen son wanted a weighted blanket and is very happy with it and uses it every night. He has a twin bed and it slightly overhangs. Good size. My only complaint was it was a Christmas gift and it came in the Sharper Image box which clearly states what is in it. Was surprised it wasn't repackaged by HSN. Unfortunately he answered the door for UPS and it ruined the Christmas "surprise".